This paper explores the role of public institutions in reducing or fostering neighborhood violence and crime. Understanding institutional density as a neighborhood effect, this paper examines how ten public institutions and structures influence crime rates in Chicago. Using multivariate regression analysis and geo-coded spatial models, the relationship between the institutions and four different crime statistics (homicide, assault, robbery, and burglary) are analyzed. The findings show that the public institutions have very little impact on crime. Publicly owned vacant lots, however, exhibit a positive relationship with neighborhood crime. To address neighborhood crime, policy makers, urban planners, and residents should be conscious of how city space is used. Still, the question remains whether third variables (racial heterogeneity and socioeconomic factors) are significant factors influencing the relationship between institutions and crime. For decades, urban scholars have studied the consequences of uneven resource and service distribution throughout cities. Overall, the empirical evidence confirms that areas facing concentrated disadvantage experience higher levels of crime and violence. The Chicago School, particularly Shaw and McKay (1942), established the social disorganization theory, outlining how uneven distribution of crime throughout the city is a consequence of social disorganization in those areas. Shaw and McKay claimed that neighborhood effects like poverty, absence of strong social networks, and ethnic heterogeneity exhibited strong relationships to crime in cities (Shaw and McKay 1942). This research provided an important foundation for later scholars to examine the interaction of different neighborhood effects. In his seminal research, urban scholar Robert Sampson found that social cohesion and collective goals, what he termed ‘collective efficacy,' is negatively related to neighborhood crime. Networks and social ties within a neighborhood, Sampson and his colleagues argued, are important mechanisms that can prevent and reduce violence. Their research also explored institutional density over time, determining that the density of non-profits was one of the strongest predictors of neighborhood collective action while church density had almost no influence (Sampson 2012). However, Sampson failed to directly connect institutional density to neighborhood crime level, relying on his research on social networks to fill the gap. The work of other researchers found more limitations in Sampson's study of social networks. Warner and Roundtree found that social ties were insignificant in predicting crime in minority or ethnically diverse neighborhoods (1997), while Pattillo found that neighborhoods with dense social networks inconsistently had high crime rates (1998). In order to understand the contradictory findings of these researchers, scholars have begun to explore the significance of Sampson's institutional argument. The research of Mario Luis Small (2006) found that institutions act as ‘resource brokers,' creating networks in which resources and services can be distributed. Therefore, the availability and density of institutions is essential in understanding how neighborhoods interact and function. The purpose of this paper is to further explore the role of institutions as a neighborhood element that prevents or reduces crime. Research has only minimally covered this topic, leaving many gaps in the study. Peterson, Krivo and Harris's (2000) study of libraries, bars and recreational centers had limited findings suggesting institutions lack sufficient breadth to create change. These findings, common throughout other research, could also signal limitations due to data deficiency and third variables (Bellair 1997, Triplett et. al 2003). This paper will explore public institutions as a neighborhood effect and their relationship to neighborhood violence. I will begin with a discussion of research by Sampson and other scholars on institutional strength. Following this discussion, I will present my data and research on Chicago neighborhoods. I will then explain my findings and their implications. I will conclude with a discussion on remaining limitations and areas for future research. Many scholars have examined Sampson's research in an effort to better understand the function of social networks and institutions in neighborhoods. Recently, urban researchers have taken more interest in the neighborhood, debating to what extent the neighborhood is important, what constitutes a neighborhood, and when research should be conducted on the neighborhood level (Sharkey and Faber 2014). The study of uneven development has been an important topic in the development realm, holding special social significance (Messner and Tardiff 1986, Smith 1982). The spatial unevenness of societal development has been linked to the uneven distribution of crime in many studies (Messner and Tardiff 1986, Patterson 1991, Short 1997, Warner 1993). More so, these studies have determined that areas with concentrated poverty are positively related to higher crime rates, both across time and space (Keene and Bader 2013, Massey and Kanaiapuni 1993, Morenoff and Sampson, Quillian 1999, Wilson 1987). In most studies, neighborhood effects result in enduring neighborhood features, and have often proven to have a "spill over effect" on surrounding areas. Just as Sampson observed, neighborhoods are susceptible to poverty traps, partially as a result of geography. A middle class neighborhood surrounded by impoverished neighborhoods is more likely to experience higher rates of unemployment and crime than a neighborhood surrounded by higher-income neighborhoods (Sampson 2012, 240-246). Scholars observe that this trap is replicated on the organizational level. Studies on Cleveland and San Diego neighborhoods found that higher rates of crime were present in areas directly surrounding public high schools. In contrast, areas surrounding private schools experience no change (Roncek and Donald 1985, Roncek and LoBosco 1983). Public schools' lack of ‘proprietary definitions' parallels Roncek and Maier's crime "hot spots" (1991). Hotspots are areas of increased crime due to institutional anonymity and minimal guardianship. Crime increases in areas where institutions and structures do not promote ownership. However, where communities with strong community ties and collective action, collective efficacy will reduce crime (Sampson 2012). Sampson also observed the enduring nature of organizations in neighborhoods. In his study of non-profit organizations and churches, the density of organizations in 1990 was a very accurate predictor of institutional density in 2005 (Sampson 2012, 196). This characteristic makes the study of organization strength incredibly valuable. If organizations are enduring features of neighborhoods, their ability, or lack thereof, to influence neighborhood effects is vital to understanding future crime prevention and reduction policy. This question requires an investigation of institutional strength (Triplett et al. 2003) and capacity (Small 2006). This paper returns to the city of Chicago where Sampson conducted his research. Just as many scholars have confronted the issue of defining ‘neighborhood' (Sharkey and Faber 2014), Sampson argues that neighborhoods are "both chosen and allocated" (Sampson 2012). In an attempt to account for context and space, Sampson and many other scholars have turned to econometrics to estimate social capital (Mohen et al. 2014, Sampson 2012). Although Sampson works primarily with 343 constructed neighborhood clusters, he relies on a variety of operational definitions to study the neighborhood. 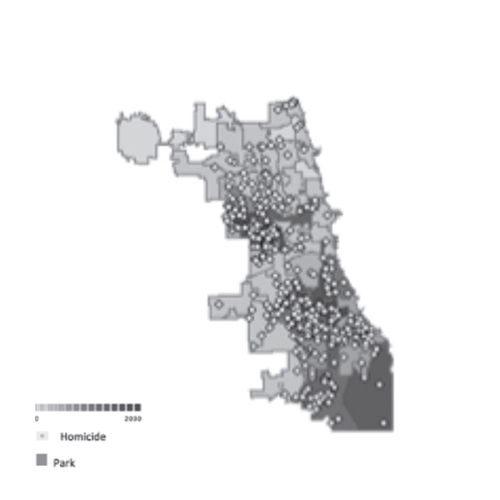 In this study, I use the 2013 ward boundaries to operationalize Chicago neighborhoods. Although this does pose the risk of losing important social context of ‘the neighborhood,' this measurement affords the best available data while controlling for population size. The City of Chicago's Data Portal provides data on a variety of crime and institutional characteristics by ward. The dependent variable (crime) is operationalized by 2013 crime statistics, disaggregated by activity. For the most part, this study examines homicides by ward, but supplemental analysis of assault, robbery, and burglary is also used. Because institutions are enduring characteristics of neighborhoods, the focus of this paper is to analyze the relationship between institutions and crime across neighborhoods, rather than across time. In order to best understand the effects of public services and institutions on neighborhood crime, I examine a total of ten independent variables: the density of health clinics, hospitals, libraries, police stations, prisons/jails, schools, early learning programs, L-train stations, publicly owned vacant lots, and public parks. All but three of the independent variables are classified by ward, and are thus statistically relevant. These variables represent an assortment of institutions throughout the city that serve different social, economic, and environmental functions. Some represent positive-promoting institutions (e.g. health clinics, libraries), while others represent institutions to dissuade (e.g. prisons/jails, vacant lots). Ideally, the strength of these institutions should be measured to best understand their impact, because the impact of a single institution has varies greatly depending on its resources, support, size, and organization (Triplett et al. 2003). Since this information is not currently available, findings presented here must be understood as if each institution holds the same capacity. Additionally, the location of certain institutions may be conditional on a third variable. For instance, health clinics may be part of the government Women, Infant, and Children (WIC) program, serving lower-income neighborhoods. Similarly, early learning programs such as Head Start specifically target low-income children and families. Therefore the presence of such organizations could indicate a relationship between income and crime, rather than a relationship between such institutions and crime rate. The relationship between these characteristics and institutional density is acknowledged in my findings and discussion. Employing a quantitative method, I use basic statistical analyses to observe the relationships between the ten public institutions and local crime. To capture a preliminary understanding of any relationship, I compute the correlation between all independent and dependent variables. After the initial findings, I conduct a multivariate regression on the variables exhibiting the strongest correlations. Because standard multilevel regression can disregard important spatial context in and between neighborhoods, I also use longitudinal geocoded spatial models of Chicago to visually examine neighborhood patterns and relationships (Xu 2014). The core analyses of this paper examine the relationship between the ten public institutions and neighborhood crime level. Most wards only possess a few, if any, of each type of institutions. The data reveal that parks, vacant lots, schools, and early learning programs are the most prolific institutions throughout the city, boasting much higher densities throughout each ward. The crime data reveal that in 2013, there were 418 homicides in Chicago, with an additional 17,965 assaults, 11,822 robberies, and 17,890 burglaries spread throughout the city. Because of the high number of assaults, robberies, and burglaries, it is very difficult and, in many ways spatially irrelevant, to analyze spatial models of those crimes. The results of the first correlation analysis, calculating the correlation between all institutions and crime by ward are presented below. An examination of the correlation test reveals that all but one independent variable show no significant correlation with neighborhood homicides, assaults, robberies, or burglaries. The density of vacant lots per ward, however, shows a strong correlation with neighborhood homicides, assaults, and robberies. Interestingly, a similar correlation is not observed with the density of parks per ward despite their similar attributes. It is important to take into consideration that the data collected on vacant lots were measured by count while parks were measured by square area. 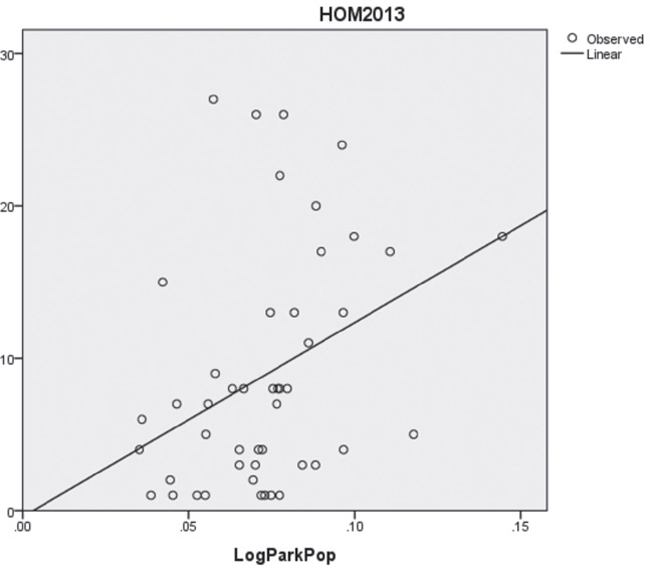 When calculated again using log(Parks) ÷ population, the correlation is significant. These models indicate that there is significant correlation between these neighborhood places and crime levels. Open spaces, whether abandoned public lots or public parks, are positively correlated to instances of homicide throughout the Chicago wards. Publicly owned vacant lots have the strongest correlation with neighborhood crime. I use these two findings to perform multivariate regression analyses. Standardized beta coefficients (ß) address unit disparities, so that the variance is 1. Here, the log of vacant lots exhibits the most significant coefficient, so that ß (logVacantLots) = .723. The other variables did not exhibit significant findings, presenting a strong case for the relationship between vacant lots and crime. Figures 3 and 4 illustrate these relationships in scatterplots. Neither scatterplot exhibits very strong linear regression, but a moderate relationship for both variables can be observed. To explore this relationship more, I generated spatial models of Chicago. I shaded wards by the number of vacant lots and then superimposed a map of 2013 homicides. 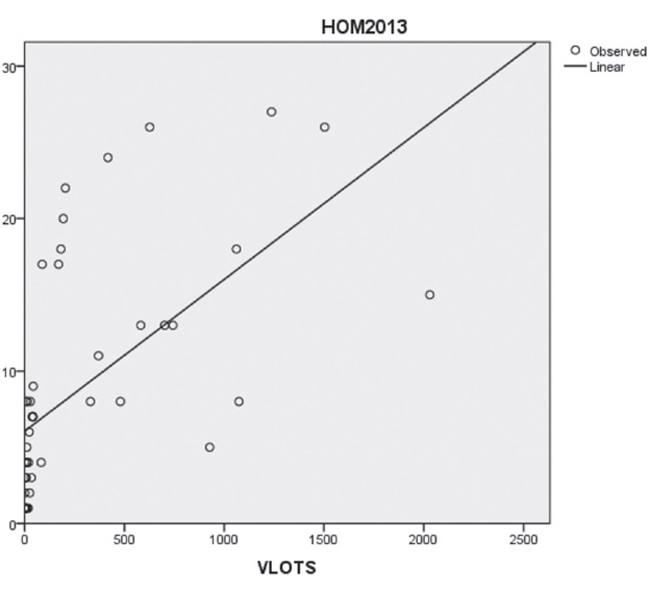 Wards with a higher density of vacant lots appear to have higher instances of homicides, just as the correlation analysis suggested (Figure 5). This spatial model confirms that homicides are concentrated in a number of wards that have comparatively high densities of vacant lots. In Philadelphia neighborhoods, vacant lots and aggravated assaults by block groups exhibited a near linear correlation (Branas et al. 2012). Similarly, block groups with high levels of vacant properties had higher rates of aggravated assault when bars and parks/playgrounds were nearby. This calls attention to my finding on parks. In Figure 6, park locations are added to the model. Parks are scattered throughout the city, with a concentration on the eastern border. As highlighted in Roncek and Maier's research (2006), vacant lots and parks are both structures with minimal understanding of ownership, posing an interesting question regarding the relationship between vacant lots and parks in cities. While no correlation was found between parks and vacant lots, their interaction may be an interesting subject for further examination. Similarly, the spatial models of schools and early learning programs are inconclusive. The number of schools and early learning programs are too large to observe any significant pattern. Nonetheless, this spatial modeling brings to our attention that these institutions are products of strategic urban planning. As briefly discussed earlier, subsidized childcare centers target low-income areas. Over 55 percent of the early learning programs identified in the data receive Head Start funding. Although many social disorganization theories posit that lowincome neighborhoods lack public services and institutions, when analyzed on the neighborhood level these areas often have the most affordable institutions (Small and Stark 2005). Thus, these Head Start programs are most likely located in disadvantaged neighborhoods to target low-income households. The relationship between institutions and income is essential to consider. Income level and racial heterogeneity are two of the most significant variables discussed in similar research and should not be overlooked. To address these possible covariates and examine how they interact with my independent and dependent variables, I generated models of Chicago that mapped racial heterogeneity and poverty level. Below, I present three models of Chicago. The first model illustrates the population of African Americans per ward. The second model illustrates Chicago by the percent of the population below the poverty line by community area. The third model illustrates the density of vacant lots by ward. Analysis of the spatial models reveals an important finding. Figures 7 and 9 are extremely similar, while Figure 8 shows only a moderate resemblance. These models suggest that the racial make up of a ward has a strong interaction with the density of vacant lots, thus a strong relationship to crime levels. Meanwhile, the poverty level appears to have very little relationship to the number of vacant lots. These findings are supported by previous research by Bursik and Grasmick (1993, 276-277). Their study of Chicago between 1960 and 1980 found that economic deprivation has a significant direct effect on delinquency, but that additional neighborhood effects that are not traditionally recognized by social disorganization theorists must be considered. Although racial composition is recognized by the social disorganization theory as a driving force of disorder, its interaction with other neighborhood effects is an important concept that requires more consideration. While these spatial models cannot come to a causal conclusion, a distinct relationship between racial composition, vacant lot density, and homicide rate is apparent. These findings indicate important areas of focus. First, they reveal that how space is used or not used, as in the case of vacant lots, may play a role in determining the neighborhood effect on crime. Second, institutions do play a role in a community, but the extent of that role is not decided by its function, necessarily. Rather, it may be more interesting to examine how and to what extent people interact with these institutions. Finally, this study discredits the notion that policy and institutions create collective efficacy. Although institutions may play important roles on the local level, their capacity to reduce violence is not supported by my findings. Institutions, more likely, provide a setting where social ties and networks can be built. Thus, the extent that people interact with the institutions, but also the extent that different institutions interact with one another is important to consider. My finding that vacant lots are strong predictors of urban crime supports the concept that a negative perception of a space can have a negative effect on neighborhood security. Sampson, building on Kelling and Wilson's "broken window theory," found that perceived disorder in Chicago is a strong predictor of neighborhood crime (Kelling and Wilson 1982, Sampson 2012) Cities are defined by their places, which provide residents with a sense of identity, community, and security (Chen et. al 2013). This important source of social capital is not only important for the residents, however, but is essential for policymakers and urban planners who aim to reduce urban violence. The lack of investment in these vacant lots increases the perception of disorder. The vacant lots studied in this paper are publicly owned, but nonetheless exhibit minimal ownership by the government or the residents. The correlation in my findings between racial make-up of wards and the density of vacant lots prompts questions about urban planning choices in the city of Chicago. These lots hold potential to transform into places that foster collective efficacy. Reports by Jacobs and Newman express the importance of urban planning in reducing violence (Jacobs 1961, Newman 1972). Architecture and urban planning should be more seriously considered by policymakers attempting to reduce violence. If ‘negative places' correlate with levels of crime, why was no correlation detected between ‘positive places' and a reduction of crime? Schools, libraries, and parks are positive places that one would expect to promote identity and community. These findings suggest that state services and institutions do not necessarily promote collective efficacy and urban crime reduction. Instead, collective efficacy should be understood as a force that transpires independent from policy. Thus, the way in which residents interact with institutions is much more important than the institutions themselves. The networks and social ties created as a result of local institutions, ultimately may play a large role in urban governance, thus in crime reduction (Hendricks 2014, 556). In many cases, local self-organization arises when the state cannot or does not provide for residents (Koonings and Kruijit 2007, Goldstein 2004). In his research, Sampson concluded that the most effective way to promote social change in a neighborhood was from within (2012). Considering my findings, state institutions may provide important services to a community, but their ability to effect greater social change is greatly limited. Although some studies have been done on various other community structures, very little research has been done regarding local institutions operated and governed by residents. This research would require very specific data that wouldn't necessarily be provided by the city, but its findings would be central to determining the importance of community organization in crime reduction. "Governance," as Hendricks writes, "is a compound of both horizontal and vertical, both non-formal and formal arrangements" (2014). Thus, how local, state and other institutions interact is vital in understanding their impact. The capacity of an institution to affect neighborhood crime may also rely on its capacity to work with other sectors, such as non-profits, corporations, community groups, and religious organizations (Kelling and Coles 1996). An institution is not inherently strong because it is state run, rather institutional strength is derived from its stability, resources, clear expectations, and interconnectedness (Triplett et al. 2003). This may explain why the mere presence of the public institutions studied in this paper appears to have no relationship to crime rates. The value of community interaction and multi-sector interaction also requires more investigation, but research suggests that these forms of interaction are highly valuable in determining an institution's capacity to promote collective efficacy and reduce crime. Additionally, the importance of movement and change over time remains a critical point of interest. While literature has begun to address importance of spatial and temporal dynamics neighborhood, this area merits more attention. A study of the process of gentrification could provide insight on the contingency of economic contexts for institutional effects. In brief, research indicates that local institutions can influence the level of neighborhood violence, but the impact chain remains unclear. The findings of this paper indicate that public institutions do not appear to have any relationship to neighborhood violence, but publicly owned vacant lots appear to be positively related to neighborhood violence. These vacant lots also appear to have a significant relationship to the racial make-up of a neighborhood, supporting the concept that minority neighborhoods experience higher levels of violence and crime. While we cannot assume more vacant lots cause more homicides, local communities intending to reduce violence should consider the importance of spaces and places. While the value of services public institutions provide should not be overlooked, vacant lots provide excellent opportunities to transform a negative space into a positive place. Considering the findings of earlier research, policymakers should concentrate on how to exploit existing institutions to generate stronger social cohesion and collective action. Monica Floyd was a student of International Studies. She graduated in December of 2015. School of International Service (SIS), American University. Bellair, Paul. 1997. "Social Interaction and Community Crime: Explaining the Importance of Neighbor Networks." Criminology 35, 677-703. Web. Accessed: 1 December 2014. Branas, Charles C., David Rubin, and Wenshang Guo. 2012. "Vacant Properties and Violence in Neighborhoods." ISRN Public Health, 1-9. Web. Accessed: 2 December 2014. Bursik, Robert and Harold G. Grasmick. 1993. "Economic Deprivation and Neighborhood Crime Rates." Law and Society Review 27, 263-283. Web. Accessed: 3 December 2014. Bursik, Robert J. and Harold G. Grasnick. 1993. "Economic Deprivation and Neighborhood Crime Rates." Law & Society Review 27(2), 263-284. Web. Accessed: 2 December 2014. Chen, Xiangming, Anthony M. Orum and Krista E. Paulsen. 2013. "Cities as Places and Spaces." In their: Introduction to Cities. How Place and Space Shape Human Experience. Chichester: Wiley, 6-47. Goldstein, Daniel M. 2004. The Spectacular City. Durham, NC: Duke University Press. Hendriks, Frank. 2014. "Understanding Good Urban Governance: Essentials, Shifts, and Values." Urban Affairs Review 50(4), 553-576. Web. Accessed: 2 September 2014. Hongwei, Xu. 2014. "Comparing Spatial and Multilevel Regression models for Binary Outcomes in Neighborhood Studies." Sociology Methodology 44(1), 229-272. Web. Accessed: 1 December 2014. Jacobs, Jane. 1961. "The Death and Life of Great American Cities [exerpt]." In: Bridge, Gary, and Sophie Watson (eds. ), The Blackwell City Reader. Malden, MA: Blackwell, 273-277. Keene, Danya, Michael Bader, and Jennifer Ailshire. 2013. "Length of Residence and Social Integration: The Contingent Effects of Neighborhood Poverty." Health & Place 21, 171-178. Web. Accessed: 20 November 2014. Kelling, George L. and Catherine Coles. 1996. Fixing Broken Windows. New York, NY: The Free Press. Kelling, George L. and Catherine M. Coles. 1996. Fixing Broken Windows: Restoring Order and Reducing Crime in Our Communities. New York; Martin Kessler Books. Massey, Douglas S. and Shawn M. Kanaiapuni. 1993. American Apartheid: Segregation and the Making of the Underclass. Cambridge, MA: Harvard University Press. Messner, Steven F. and Kenneth Tardiff. 2006. "Economic Inequality and Levels of Homicide: An Analysis of Urban Neighborhoods." Criminology 24(2), 297-316. Web. Accessed: 20 November 2014. Mohnen, Sigrid M., Beate Völker, Henry Flap, S.V. Subramanian, and Peter P. Groenewegen. 2014. "The Influence of Social Capital on Individual Health: Is it the Neighborhood of the Network?" Social Indicators Research, 1-20. Web. Accessed: 13 November 2014. Morenoff, Jeffrey D. and Robert Sampson. 1997. "Violent Crime and the Spatial Dynamics of Neighborhood Transition: Chicago, 1970-1990." Social Forces 76(1), 31-64. Newman, Oscar. 1972. Defensible Space: Crime Prevention through Urban Design. New York: Collier-Macmillan. Patterson, Britt. 1991. "Poverty, Income Inequality and Community Crime Rates." Criminology 29, 755-776. Web. Accessed: 3 December 2014. Pattillo, Mary. 1998. "Sweet Mothers and Gangbangers: Managing Crime in a Black Middle-Class Neighborhood." Social Forces 76(3), 747-774. Web. Accessed: 4 December 2014. Peterson, Ruth, Lauren Krivo, and Mark Harris. 2000. "Disadvantage and Neighborhood Violent Crime: Do Local Institutions Matter?" Journal of Research in Crime & Delingquency 37(1), 31-63. Web. Accessed: 1 December 2014. Quillian, Lincoln. 1999. "Migration Patterns and the Growth of High-Poverty Neighborhoods, 1970-1990." American Journal of Sociology 105(1), 1-37.Web. Accessed: 4 December 2014. Roncek, Dennis W. and Antoinette Lobosco. 1983. "The Effect of High Schools on Crime in their Neighborhood." Social Science Quarterly (University of Texas) 64(3), 598-613. Web. Accessed: 4 December 2014. Roncek, Dennis W. and Donald Faggiani. 1985. "High Schools and Crime: A Replication." Sociology Quarterly (Kansas State University) 26(4), 491-505. Web. Accessed: 3 December 2013. Roncek, Dennis W. and Pamela A. Maier. 2006. "Bars, Blocks, and Crimes Revisited: Linking the Theory of Routine Activities to the Empiricism of ‘Hot Spots.'" Criminology 29(4), 725753. Web. Accessed: 4 December 2014. Sampson, Robert J. 2012. Great American City. Chicago, IL: University of Chicago Press. Sharkey, Patrick and Jacob Faber. 2014. "Where, When, Why and For Whom Do Residential Contexts Matter? Moving Away form the Dichotomous Understanding of Neighborhood Effects." Annual Review of Sociology 40, 559-579. Web. Accessed: 1 December 2014. Shaw, Clifford and Henry Donald McKay. 1942. Juvenile Delinquency and Urban Areas: A Study of Rates of Delinquents in Relation to Differential Characteristics of Local Communities in American Cities. Chicago, IL: University of Chicago Press. Short, James F. 1997. Poverty, Ethnicity, and Violent Crime. Oxford: Westview Press. Simcha-Fagan, Ora and Joseph Schwartz. 1986. "Neighborhood and Delinquency: An Assessment of Contextual Effects." Criminology 24(4), 667-703. Web. Accessed: 1 December 2014. Small, Mario Luis and Laura Stark. 2005. "Are Poor Neighborhoods Resource Deprived? A Case Study of Childcare Centers in New York." Social Science Quarterly 86, 1013-1036. Web. Accessed: 20 November 2014. Small, Mario Luis. 2006. "Neighborhood Institutions as Resource Brokers: Childcare Centers, Interorganizational Ties, and Resources Access among the Poor." Social Problems 53(2), 274-292. Web. Accessed: 2 December 2014. Smith, Neil. 1982. "Gentrification and Uneven Development." Economic Geography 58(2), 139-155. Web. Accessed: 4 November 2014. Triplett, Ruth, Randy Gainey, and Ivan Sun. 2003. "Institutional Strength, Social Control and Neighborhood Crime Rates." Theoretical Criminology 7(4), 439-467. Web. Accessed: 1 December 2014. Warner, Barbara. 1997. "Local Social Ties in a Community and Crime Model: Questioning the Systemic Nature of Informal Social Control." Social Problems 44(4), 520-536. Web. Accessed: 2 December 2014. Wilson, William Julis. 1987. The Truly Disadvantaged: The Inner City, the Underclass, and Public Policy. Chicago: University of Chicago Press.